If you don’t like avocados, stop reading now! If you do, this is a wonderfully simple, tasty and easy meal. It was a great start to our day. Avocado fun facts – Did you know that while avocados are cultivated in tropical and Mediterranean climates throughout the world, the avocado is native to Central Mexico? The major commercial producers of avocados include the United States, Mexico, the Dominican Republic, Brazil and Colombia. Did you know that the avocado is also known as the Alligator Pear? Did you know that 95% of ALL the avocados grown in California trace back to a single tree – the Hass Avocado tree? Sadly, nobody knows what variety of seed produced the original Hass Mother Tree which lived for 76 years. How about this – Did you know that the avocado is a climacteric fruit, meaning it matures on the tree, but ripens off the tree? When mature, the avocado is rock hard. It’s harvested in this fashion and shipped all over the world. A green, firm, unripened avocado typically takes four to five days to ripen at room temperature. Needless to say, avocados are an interesting fruit. Not only are they interesting in their history and background but they are interesting from a culinary perspective as well. For instance, when you mention the word avocado the thing that pops in most people’s mind is guacamole. While guacamole is a wonderfully tasty and easy to make dish, an avocado has so many more uses than guacamole. You can use them in salads. In Crab and Shrimp Stuffed Avocado with Tomato Ceviche Sauce, we showed you that avocados make beautiful edible salad cups stuffed with crab and shrimp. 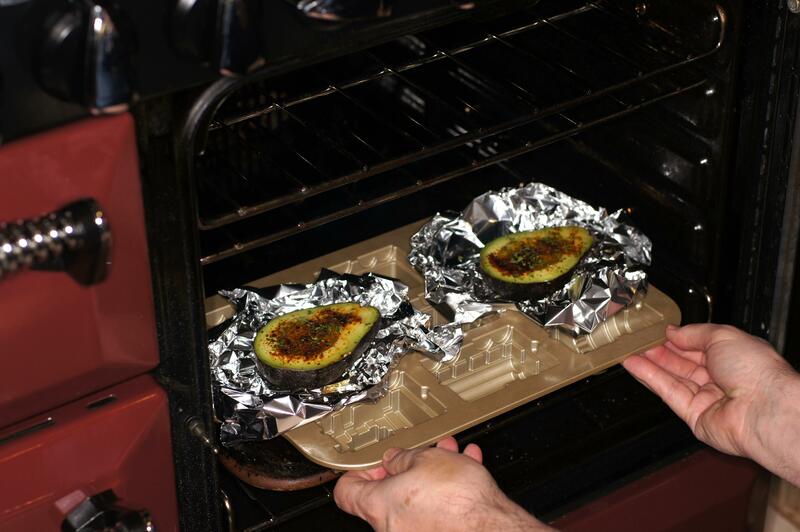 In Grilled Avocado Stuffed with Red Chile Braised Pork, we also showed you that avocados can be grilled and stuffed with wonderful meats for a main course dish. Because of it’s high concentration of fat, avocados can be used as a fat substitute for baking. You can make ice cream with avocado. I even have a recipe for an avocado pie (perfect for summer) that I have been wanting to make. Today, however, is a breakfast dish. This is what we did. Remove enough avocado flesh to hold a large egg. 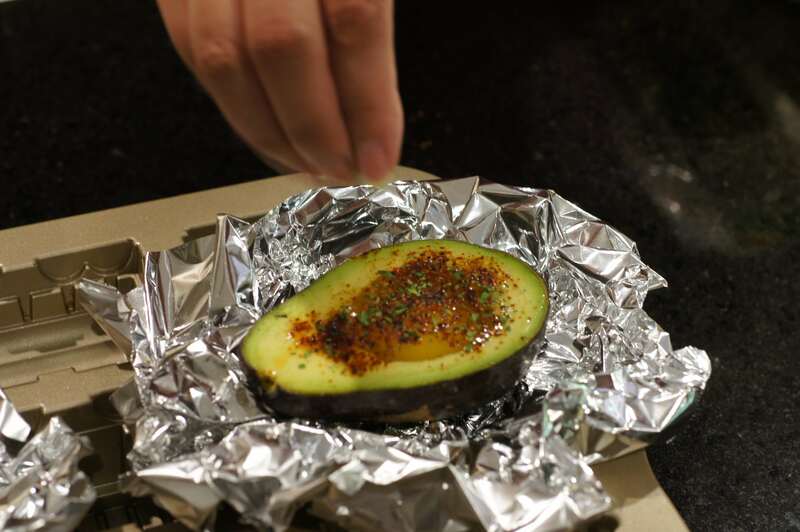 Place on a foil bed to keep the avocado from rolling. 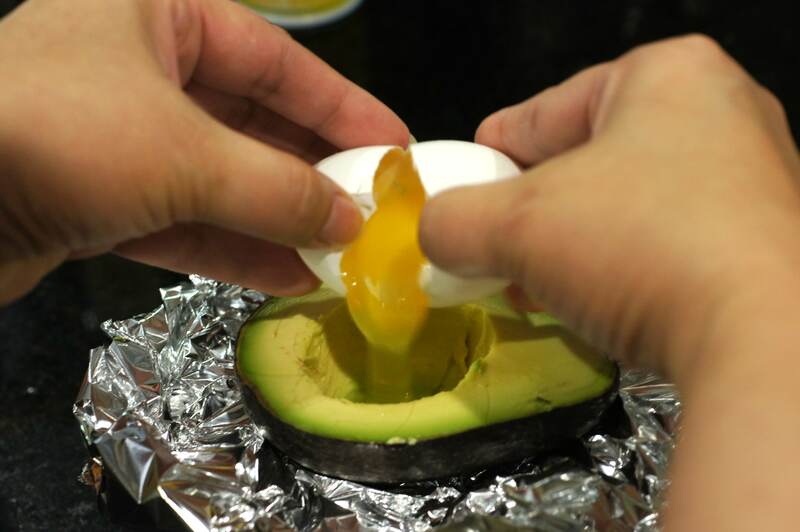 Crack an egg and fill the hollow of the avocado with the egg. Season with salt. pepper, ancho chile rub and cilantro. Place in a 450 F preheated oven for 12 minutes or until done. Remove from oven, serve with corn tortillas or toast and enjoy! We most certainly did. I suppose you could cut a small slice off the bottom to get it to hold steady, without resorting to all that foil. This looks so good, will certainly try! You could. In fact, Baby Lady and I were discussing peeling it, slicing the bottom and serving it that way. You just have to be careful with the bottom slice and how you scoop out the excess flesh to hold the egg. The peel gives you a little added protection. You could also use a cornbread corn muffin mold as it is about the right size. I have one somewhere but couldn’t find it. … or an avocado… This is a great idea!! Yum 🙂 I actually found this recipe not long ago, but had completely forgotten to try it. It looks so good. Haven’t tried cooked avocado yet, but I will! Hi, Stefan. This is a wonderful breakfast. I think you will like it. 🙂 It spreads beautifully on toast. I’ve never had a baked avocado of any kind. But this looks so good! Great idea Richard! I haven’t been that keen on cooked avocado in the past (I prefer it raw) but this recipe looks delicious enough to change my mind. I love baked eggs, especially with stewed beans and a bit of spice. I’ll give this recipe a go. Thanks so much for sharing! Great minds think alike! 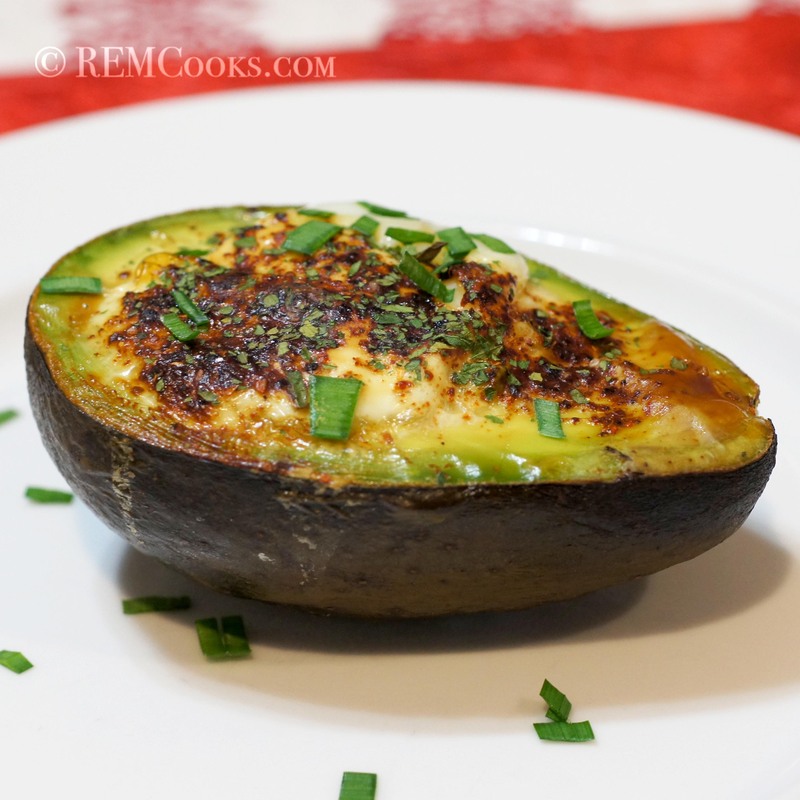 I had a post on baked avocados and eggs go up today, and then I saw yours in my reader. I love your use of chili rub and cilantro. We’ll have to try that next time. I’m glad you linked to your grilled avocados and pork too. I missed that one, but we are definitely trying it once we get the grill fired up this year! This would make a nice brunch item. At twelve minutes are the yellows still soft? Thank you Richard, they sound great. Never had baked avocado, Richard, but this is such a great way to prepare and serve an egg. Spring it on your brunch guests and I can hear the oohs. Nicely done. Hi, John. Thanks for the nice compliment. We like it because it is very tasty, so simple to do and does make a great presentation. It’s perfect when you have house guests. Thanks, Alice. It was a great way to start the day! 🙂 Can you buy dried chipotles in Australia? If so, you need to try the recipe on the blog for pickled chipotles. They are incredibly tasty and spicy hot! I love that you find a way to work in those chillies, regardless of whether it’s breakfast, lunch, dinners or desserts! I often do, but it’s usually asian dried chilli flakes. She was on the hunt in Melbourne for me. I live in an old Italian area here in sydney and I’m surrounded by Asian suburbs too. For some reason, I just can’t seem to find those specialty ingredients here. I should get online to order, (but I’ve been banned by my sweetheart) after my midnight cookbook shopping spree from Book Depository & Cutlery purchases from Laguiole…whoops! But I will get back to the hunt soon! Hi, Andreea. 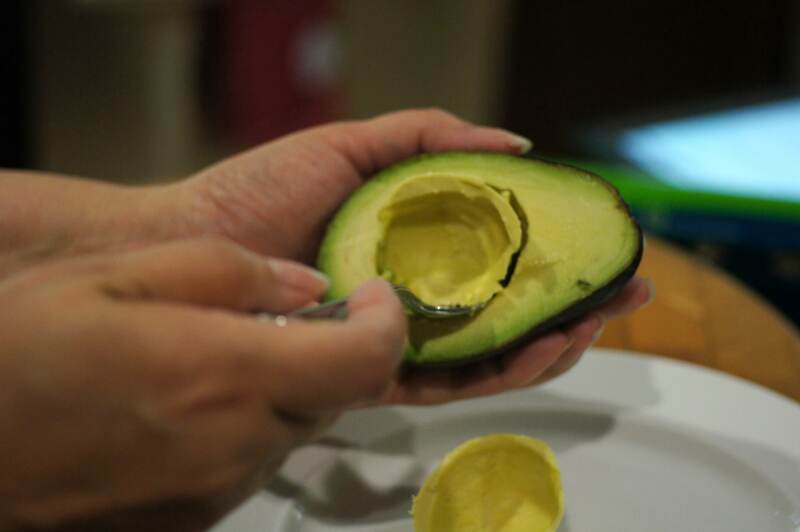 The flavor of the avocado doesn’t change but it has a creamier mouthfeel because cooking the avocado makes it softer. If you like avocados, you will really like this dish. 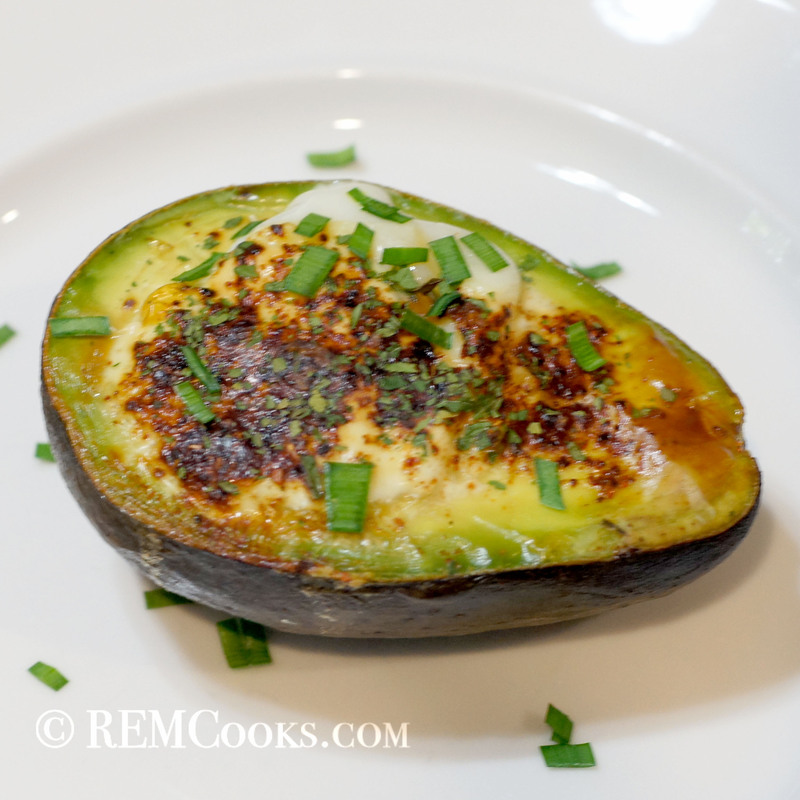 I adore avocado but have never cooked it like this…is it REALLY as good as everyone says?! Reblogged this on Slow Carb Diet Cookbook.